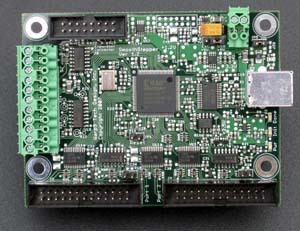 Mach 3 / 4 (200 Euro) :Mach3 is the most established controller software on the market. Most hardware is designed for this software. LinuxCNC Opensource and free alternative to Mach3. This software has little support for hardware. Most popular used for small and light CNC routers. Costs: around 60 – 100 Euro per meter. For more robust machines (working with metals and alloys). Costs: 200- 300 Euro per meter. Recommended leadscrew diameter: 17+ mm. The housing is very important, don’t use self made metal blades for this job. The housing should be connected close as possible to the axis chassis. Make sure you have access to the leadscrew nut at any time for adding grease. 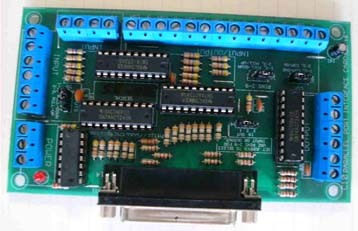 Additionally you need an interface card “Ethernet SmoothStepper – ESS” (to connect to the computer via Ethernet or USB). This bundles are great for starters and the Nema-23 are commonly used for medium sized CNC machines. If you need more motor power, just use “Nema-34” bundles! The price will double because the motors consume much more electricity. 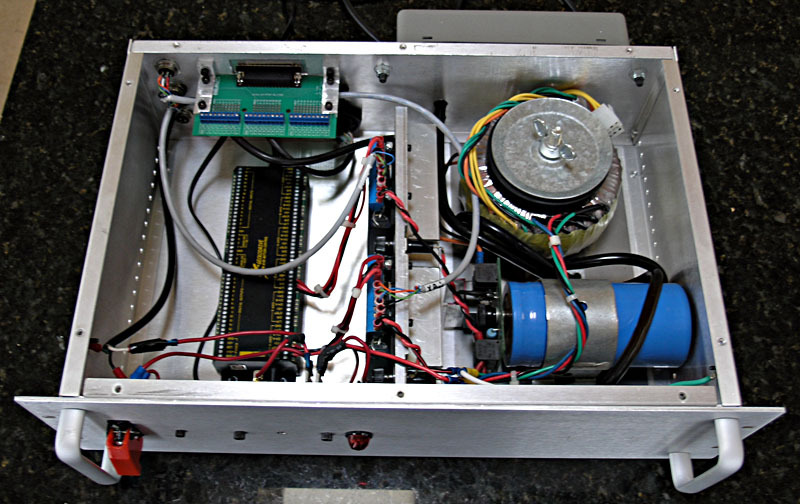 The basic difference between a traditional stepper and a servo-based system is the type of motor and how it is controlled. Steppers typically use 50 to 100 pole brushless motors while typical servo motors have only 4 to 12 poles. A pole is an area of a motor where a North or South magnetic pole is generated either by a permanet magnet or by passing current through the coils of a winding. Steppers don’t require encoders since they can accurately move between their many poles whereas servos, with few poles, require an encoder to keep track of their position. Steppers simply move incrementally using pulses [open loop] while servo’s read the difference between the motors encoder and the commanded position [closed loop], and adjust the current required to move. Some performance differences between Stepper and Servos are the result of their respective motor design. Stepper motors have many more poles than servo motors. One rotation of a stepper motor requires many more current exchanges through the windings than a servo motor. The stepper motor’s design results in torque degradation at higher speeds when compared to a servo. Using a higher driving bus voltage reduces this effect by mitigating the electrical time constant of the windings. Conversely, a high pole count has a beneficial effect at lower speeds giving the stepper motor a torque advantage over the same size servo motor. Another difference is the way each motor type is controlled. Traditional steppers operate in the open loop constant current mode. This is a cost savings, since no encoder is necessary for most positioning applications. However, stepper systems operating in a constant current mode creates a significant amount of heat in both the motor and drive, which is a consideration for some applications. 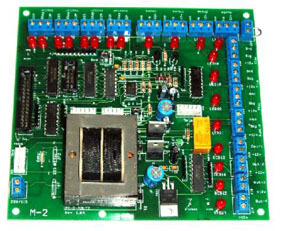 Servo control solves this by only supplying the motor current required to move or hold the load. It can also provide a peak torque that is several times higher than the maximum continous motor torque for acceleration. However, a stepper motor can also be controlled in this full servo closed loop mode with the addition of an encoder. Steppers are simpler to commission and maintain than servos. They are less expensive, especially in small motor applications. They don’t lose steps or require encoders if operated within their design limits. Steppers are stable at rest and hold their position without any fluctuation, especially with dynamic loads. Servo control systems are best suited to high speed, high torque applications that involve dynamic load changes. Stepper control systems are less expensive and are optimal for applications that require low-to-medium acceleration, high holding torque, and the flexibility of open or closed loop operation. Choosing bits to use for your CNC router can be confusing. There are a lot of variables to consider when looking for the best bit for you and your project. Here are a few key features to consider. Are you making straight cuts in plywood? Get yourself a good quality spiral cutting endmill. End mills come in many different diameters. You can choose an upcut or downcut. Are you carving large 3D contours or carvings ? You’ll want a ball nose bit that is appropriately sized for the level of detail in your model. Ballnose (aka contouring) bits are fantastic for 3d carving (think topographical maps and the grape relief on the sign at the wine shop). You can carve with just the tip to get great detail and smooth contours or they can move a lot of material just like an end mill. I used a 1/2″ ballnose bit to carve a wooden sink. For intricate 3d carving, consider a tapered ball nose bit like these. The slight angle of the cutting edge helps reduce the appearance of tool marks parallel to your material surface. om on the inside of those roman numerals for your sundial. They are available in many sizes and angles. The most common and useful angles in order are 60deg, 90deg, and 30deg. If you are flattening large boards or you are responsible for maintaining the spoil board on your CNC router, you’ll want to have a spoil board cutter or flycutter bit. These bits are made to skim the surface and leave a smooth flat finish. I recently upgraded to a 2 1/2″ bit and I love it. Its got four cutting edges and its what as known as an “insert” bit meaning the blades can be removed to be resharpened or replaced. It’s a bit of an investment but it is worth every penny. I love to use it to flatten tabletops. Hardwood? Plywood? Laminated particle board? Plastics? Aluminum? Many manufacturers make bits especial for your material of choice. Bits for hardwood are designed to leave a clean edge. Bits for plywood and laminates are designed so they won’t mangle the outer veneer layers. Bits for plastics are designed to avoid excessive melting. Aluminum cutting bits are designed to clear chips efficiently to avoid rewelding (heated chips getting fused to the hot cutting tool). Many bits can be used for multiple applications so you don’t need to buy 30 bits right away if you are in the prototyping stage of your project. A good all purpose bit is a 2-flute up cutting spiral bit. One important thing to remember when choosing a bit is that short, stout bits will produce cleaner cuts. Having excessively long bits invites tool vibration and deflection (bending) of your bit. Both of these conditions make for rough looking cuts and greatly shortened tool life. For my own work, I tend to use 3/8″ and 1/2″ shank bits. Not only do they resist deflection and vibration better than 1/4″ bits but they cut much more quietly. 1/4″ bits tend to ring and scream as they cut. You will notice a huge decrease in that deafening noise as you use larger diameter bits. Generally speaking, the bit design you choose will be designed to cut fast or cut smooth. Think of the difference between a chainsaw (fast) and a hand saw with fine teeth like a fret saw (smooth). If you need to cut a large amount of material in a hurry in a high volume production environment you’ll go for an aggressive bit that can be pushed through your material quickly. If you are making furniture and you’d rather not spend a day sanding a ton of tool marks off your nice hardwood, you’ll want to choose a bout that is made to leave a smooth finish. The more flutes (cutting edges) that a bit has, the finer the cut. A single flute bit will be very aggressive and leave a rougher edge than a 4 flute bit will. On the other hand, you can push a single flute bit through your material much faster than a 4 flute bit. This is because making one cut per rotation allows for a more aggressive feed speed than a bit that makes 2, 3, or 4 cuts. Chip clearance is also improved with fewer flutes meaning faster cuts. Spiral bits are a great multipurpose tool for lots of applications. I used 2-flute spiral bits for all of my work for at least the first year I used my ShopBot. They offer a good balance of of cut speed and edge finish and can cut a variety of materials from wood and foam to plastics and even aluminum. The biggest decision you’ll need to make when picking your bit is cut direction. Your choice are uncut, downcut, and compression (a combination of upcut and downcut). Upcutting bits mounted in a CNC pull chips (and your material) up and away from the table. They are great at clearing out chips from your cuts to avoid overheating your bits. They excel at making cuts all the way through material since they just slightly lift the material and scraps up into the end of the bit. Because of the upcutting action, these bits have a tendency to splinter the top surface of sheet goods like plywood and melamine coated particle board. You also need to be very sure that your material is securely held down to the table so the bit doesn’t lift it from the table and chuck it across the room. Downcutting bits press chips and material back into the cut and into the table. The downshearing action of these bits do a fantastic job of preserving your material’s top surface. Since the chips are forced down into the cut, these bits should never be used to drill holes. The friction of the bit against the compressed chips is enough to melt plastics and start wood on fire. Downcutting bits are preferred for cutting flexible thin material like 1/16″ aluminum sheet since they keep your goods flat to the table where up cutting bits may tend to pull the material up off the table. These bits are not the best at through cuts since the bottom layer of your material is pushed away from the bit by chips and the angle of the spirals leaving a small amount of material or “onion skin”. A third option called a compression or up-down bit offers some of the benefits of both up and downcut bits. The bit is a standard downcut bit until you get to the tip. The direction of the cut is switched making the tip an upcutter. This means that you can cut through materials like plywood and you will get a clean edge on both sides. The top is shear down, the bottom is pulled up. Compression bits are never to be used to drill holes. Once the bit has been plunged beyond the direction change, the chips have no way to escape and get compressed creating an extreme amount of friction and heat. Compression bits are a little more expensive because of the complicated manufacturing of the cutting edge but they are my goto bit for nearly all of my wood cutting. When people talk about “feeds and speeds” they are referring to two specific settings. Feedrate (feeds) refer to how fast the machine moves laterally through your material. This is generally measured in feet/minute or inches/second. When you hear someone talking about “speeds” they are referring to the spindle/router RPM. Manufacturers will provide a recommended “feeds and speeds” for their bits. Some manufacturers prefer to present a target “chipload”. Chipload refers to the physical size of the chips the bit creates when making a cut. Higher feeedrates produce larger chips. Higher tool rpm produces smaller chips. If your chips are to large, you risk breaking your bit. If your chips are more like a fine powder, you are probably dulling your bit. IT’s a balancing act but start with the manufacturers recommended settings and adjust from there. Sharp bits are critical to making good looking cuts. Sharp bits are nice and quiet compared to the slapping sound of a severely dull bit. Dull bits are loud and messy. Recognizing a dull bit will get easier as you do more cuts and get your eyes and ears tuned to your machine. You can put a few hundred feet of cut time on a bit in a hurry on a CNC router. Combine that with feeds and speeds that aren’t tuned properly and that shiny new bit is toast after one job. Many manufacturers and local shops offer sharpening service for router bits. Be sure to check on the prices before you commit to have all of your bits sharpened though. Many times it’s cheaper to buy a new bit than have it sharpened. Sharpened bits can also have a slightly smaller diameter than a fresh bit. Ask the tech if your bit diameter will change after sharpening. Do not attempt to sharpen CNC bits by hand. The high speeds and forces on bits in a CNC router put great stress on the bits and hand sharpening can leave your bit misshapen and prone to a dangerous break. You’ll want to protect your investment in bits. Be sure the edges of your bits aren’t allowed to bang into each other causing nicks. Carbide can be brittle, especially when knocked against another piece of carbide. A great first project is a bit holder. Design your own to meet your needs. If you travel to and from a makerspace, make something with a closing lid so you can throw it in your bag. There are hundreds of other profiles for all kinds of special applications. Once you start production on your kickstarter project you may want to investigate more of your options. There are bits to help make dovetails, bits for etching glass, bits made specifically for drilling holes, and many other applications. Confused? Here are some suggestions to get you started. Bits you’ll want to have right away. Bits you’ll love to have as you experiment and learn more. …and a few specialty bits you might need on occasion. Boring (hole drilling) bits – in specific diameters for dowel holes, shelf supports, and many other uses. Round-over and “veining” bits to produce finished edges.